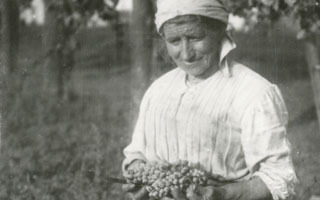 The spread of the piantata dates back to the 16th century, following the establishment of the sharecropping system and subsequent deforestation of the Po River Valley. Forest land had previously provided food, firewood, materials for building and animal feed. In order to compensate for these lost resources, trees considered most useful economically (willows, poplars, elms, mulberry, oak, etc.) were replanted on the borders of the farms and used as “live” sources of subsistence. This led to a gradual and “orderly reforestation” that over the course of two centuries returned the Po Valley to a jungle-like semblance of linked vines and trees separated in parallel rows.